On behalf of the 310th man on Manus Island, the activism by Australians and refugees to end offshore detention continues. On April 26 I invited you to attend the public reading of my letters to you, titled 'Dear Prime Minister', which took place at the Denmark Festival of Voice on June 3 and 4. I and a group of volunteers took six hours to read the 308 letters which I have been writing to you daily since 30 July 2016. The event was filmed and recorded. People drove down from Perth (450km away) to participate and to listen. The listeners heard voices of women and men, young and old, reading and often weeping. We heard the words of refugees read aloud. The letters form a narrative, as the horrors of Manus Island and Nauru are revealed, and as the conditions there worsen. We start to know some of the refugees as their words reappear. We are shocked by how young most of them are, and by how much they continue to endure. 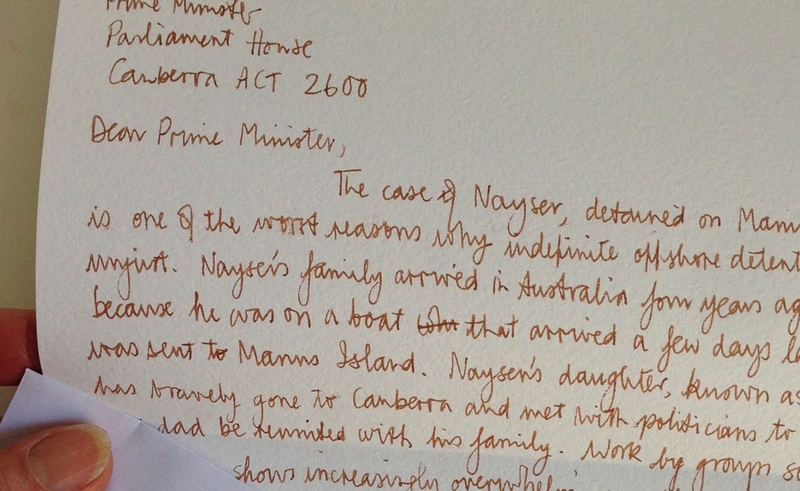 Prime Minister, I am able to give you another chance to listen to my letters to you. The 'Dear Prime Minister' readings will be performed in Perth later this month. I hope to see you there. We will continue to protest and bear witness, until you close the camps and bring them here.